What do you get when you combine Australia’s finest classical musicians with the pop hits from the 70s to the 90s? The best kind of Mixtape! Beginning in 2007, a long-term collaboration between the Benaud Trio and composer / arranger Nicholas Buc has resulted in a string of hits covering some of the 20th century’s greatest popular music. This album demands to be heard – as a trip down memory lane, but also as a realisation of the inherent musical brilliance of these songs, brought to life by some of Australia’s best-regarded classical musicians. Written over 4 years for Lehenda Ukrainian Dance Company's premiere production, Kazka recently toured Australia, Canada and the US. The music of Kazka represents a true cross section of musical worlds, combining all the hallmarks of traditional Ukrainian-style folk melodies with more contemporary scoring techniques. 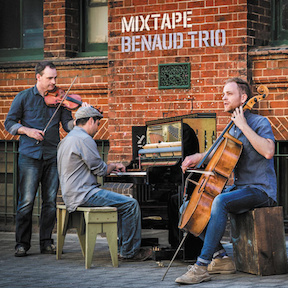 The Benaud Trio's debut album features Nicholas Buc's Trailer Music, along with other wonderful Australian works by Ross Edwards, Paul Stanhope and Matthew Hindson. Recorded at the South Melbourne Town Hall in stunning clarity, it has received rave reviews around the globe. The Benaud Trio perform cherished masterpieces by great Bohemians, Smetana and Dvořák, capped off with a spirited homage to Freddie Mercury in Nicholas Buc's arrangement of Bohemian Rhapsody. Whispers is the fifth studio album from British singer/songwriter Passenger (aka Mike Rosenberg), featuring the string arrangements of Nicholas Buc. Recorded by Chris Vallejo at Linear Recording Studios, Sydney. Vagabond is the debut album from Australian singer/songwriter Stu Larsen, featuring the string arrangements of Nicholas Buc. Co-produced by Chris Vallejo and Mike Rosenberg (aka Passenger). Symphony of Life was filmed and recorded at Hamer Hall, Melbourne during a series of sold-out concerts for her Australian fans in 2012. Arranged and conducted by Nicholas Buc, the live concert also screened on Foxtel's Ovation channel and was nominated for an ARIA Award for "Best Original Soundtrack/Cast/Show Album". As a celebration of 10 years, in 2008 Concordis released its second CD, Journey, containing 13 all-time favourite works repeatedly requested by audiences. Featuring Nicholas Buc's original work, Bungonia, a portrait of thrill-seeking bungee jumpers set in one of Australia's most treacherous canyons, as well as his now much-loved arrangement of Botany Bay.